We’ve all seen movies and TV shows where the production desperately tries to hide their leading lady’s IRL pregnancy. The girl is ALWAYS in a heavy coat. Or standing behind a kitchen counter. And there’s the good old “Have the actress hold a box of stuff in front of her stomach every scene she’s in” maneuver. It’s rare that an actress’ pregnancy is written into the story. And even more rare when it’s the pregnancy that actually inspires the whole production. 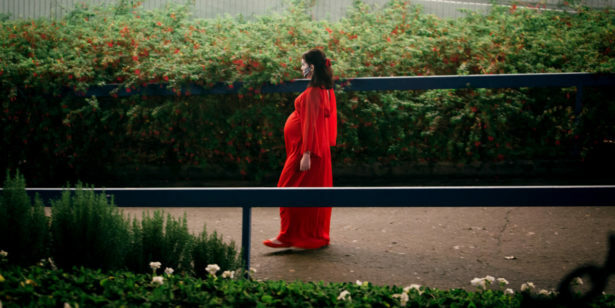 We are totally obsessed with the origin story behind Prevenge, the directing debut of Alice Lowe. Lowe is also the movie’s screenwriter and leading lady. The premise of the action-horror movie is creepy as heck: Lowe plays a woman who is driven to murder via the nonstop demands of her unborn child. EEEEEEEE! And yes, Lowe actually was in her third trimester while writing/directing/playing this pregnant lady. As Lowe told Nerdist, the whole film actually came together in her last trimester. Oh, and she shot the film in 11 days. Man, this wonder woman is REALLY making us feel lazy and unaccomplished. So she pitched a pregnancy action-horror flick, the team went wild. The director who initially approached her admitted that his thing was rom-coms. Unsure if he could handle it, he insisted that Lowe be the one to direct this flick. And it sounds like that’s exactly what happened. Prevenge did a bang-up job at SXSW this month, and is now playing in select cities and available to watch on Shudder. Oooh, we are SO here for pregnant auteurs. We hope this becomes a trend, and then we hope this trend just stays around forever.